Administration and Human Resource Unit paid a visit to Centre for Foundation Studies (CFS) staff, Br. 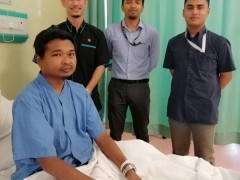 Mohd Zahid bin Baharum at IIUM Medical Centre (IIUMMC) after he was admitted on last Monday, 18th March. Br Mohd Zahid is one of the staff at Department of Biology. Br. Mohd Zahid was admitted to IIUMMC due to bad swelling on his face and head due to fluid accumulation in the brain. He has been prescribed with antibiotic by the doctor to reduce the swelling and fluid accumulation. His condition is getting better since last Tuesday and hopefully keeps improving. Let us pray to Allah, The Sustainer of Mankind, may He remove the illness, cure the disease so that Br. Zahid recuperates sooner.